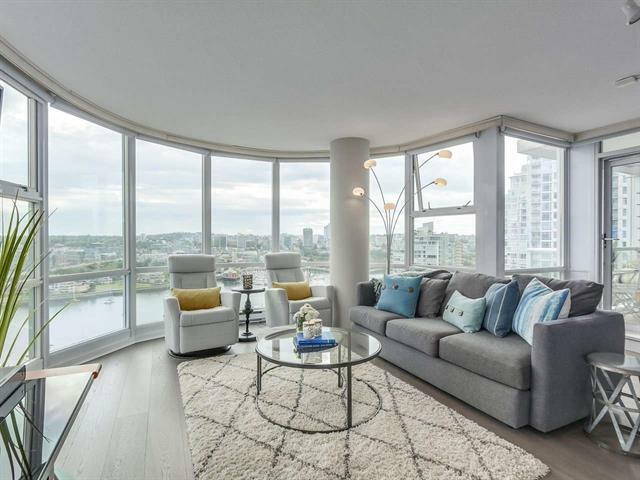 Spectacular unobstructed views of False Creek and beyond from this 2 bedroom + Den corner suite in Marinaside Residences. 25th floor south facing unit with floor to ceiling windows drenches the suite in natural light. Open kitchen design w/ granite countertops, s/s apps and gas stove. Interior features include designer electric blinds, wide plank h/w flooring throughout and california closet built ins. Separation between bedrooms for privacy and deep soaker bath in ensuite master bath. Enjoy Marinaside living w/concierge service, indoor pool, steam rooms, hot tub, fitness centre, & meeting room. Bonus: 2 side by side parking stalls and 1 Storage locker included.